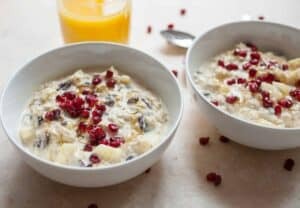 A quick and simple muesli with orange juice, yogurt, honey, apples, dried cranberries, and some pomegranate seeds. A quick and healthy breakfast! 1) Toss your oats, yogurt, milk, and vanilla in a bowl and stir it up really well. 3) In a separate bowl, mix together your orange juice and honey. Add your apples and dried fruit. 4) Let that sit for about 5 minutes to let the apples absorb some flavor. 5) Toss everything together, let it sit for 5 minutes, then enjoy! This delicious recipe was brought to you by Macheesmo. Read the full post at https://wp.me/pkSYO-2M9.